What Kind of Van Is Nanook? 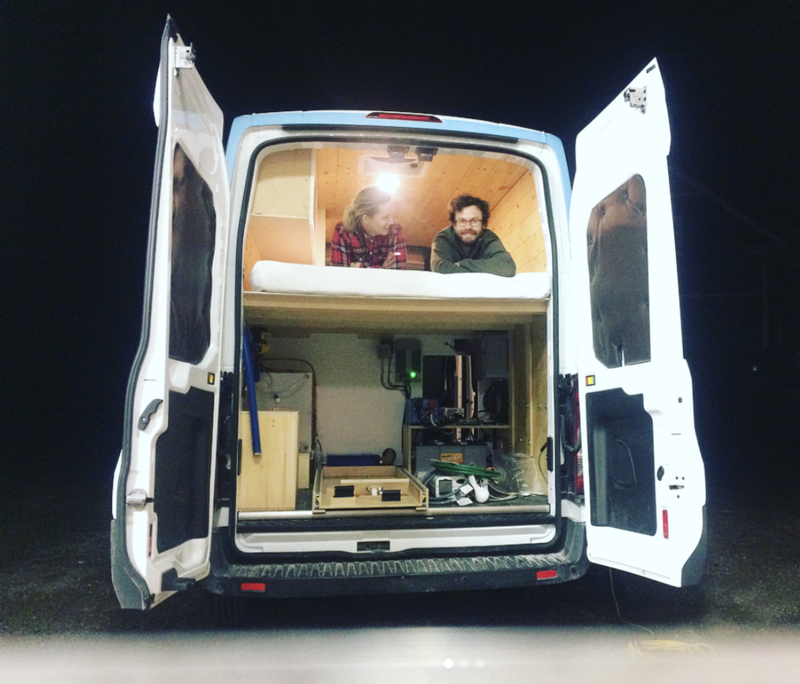 Our van is a self-converted 2016 Ford Transit 250. This high roof model has a 148” wheelbase (not extended) which means we can stand up comfortably inside and also fit in any parking space. She came with only 6,000 km (3,728 miles) driven on her standard 3.7L gasoline engine, and she handles like a car (no seriously… it’s amazing to drive). 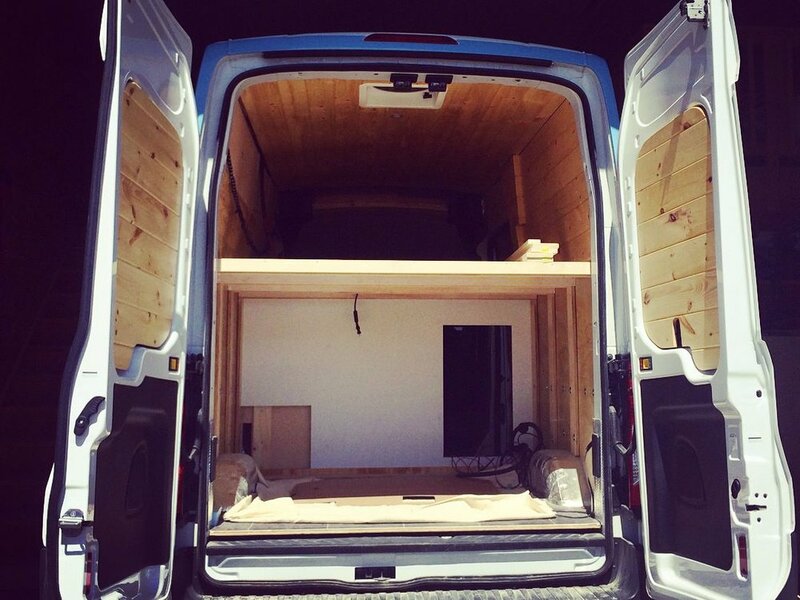 We chose this model of van for its excellent track record, affordable maintenance, accessible servicing, loads of cargo space, and general unicorn status (if you’re looking for a van, you know how hard it is to find the right one for the right price). Modifications we made to prep for our travels include: a Ranger Rack system to mount two 150w solar panels, a Deluxe MaxxAir two-way ventilation fan, a C.R. Lawrence T-Frame tinted camper window for the sliding door, a set of Michelin LTX all-terrain tires, and a swivel adaptor for the passenger seat to help open up the living quarters and provide additional seating. The cargo/living area measures approximately 11’x6’ and the conversion features: a fixed almost-queen-size bed, spacious storage ‘garage’, galley kitchen, heated outdoor shower, Propex air heater, hardwired lighting and power ports, and best of all, remains 90% reversible back to its original state. Ryan hails from the little ‘stone town’ of St. Mary’s, Ontario. An avid outdoorsman, he grew up dirt biking, hunting, and playing competitive hockey. 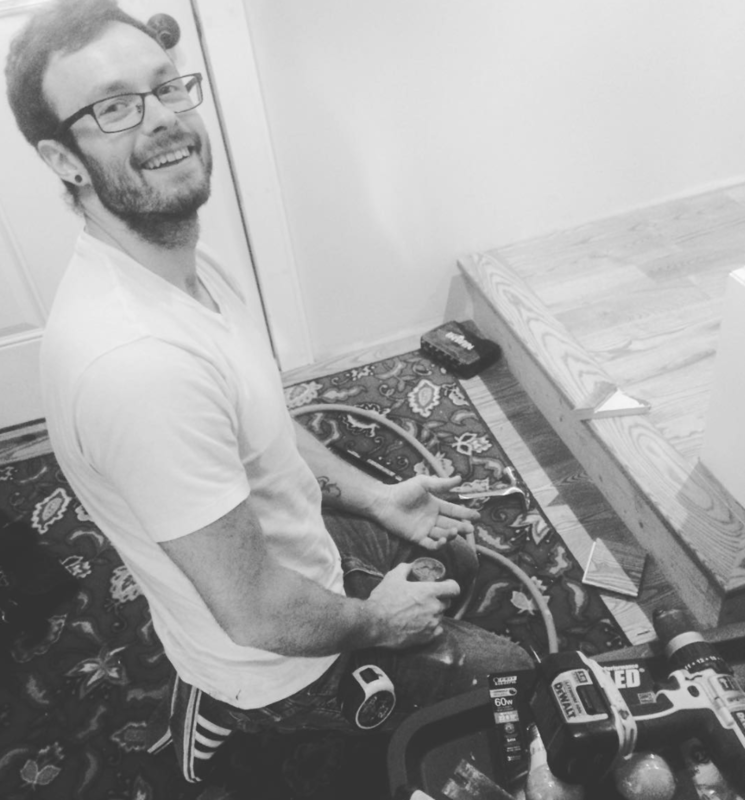 A graduate of Fanshawe College, Ryan holds a diploma in Mechanical Engineering Technology, and has additionally logged over nine thousand hours as a residential electrical apprentice. Ryan is an avid woodworker, a self-taught musician, and can be found enjoying a variety of outdoor sports in his leisure time. Sandi was born and raised in the ‘garden city’ of St. Catharines on the shores of Lake Ontario. Growing up camping, boating, hiking and girl guiding, the outdoors are very close to her heart. After receiving her college diploma in Photography, she explored a second career in hospitality and tourism. Inspired by the tiny living movement, she is now actively pursuing her passion for travel and storytelling via life on four wheels. Why did we ‘throw our lives away’ to live in sixty-six square feet without a toilet? So here's the thing... we had it pretty good. 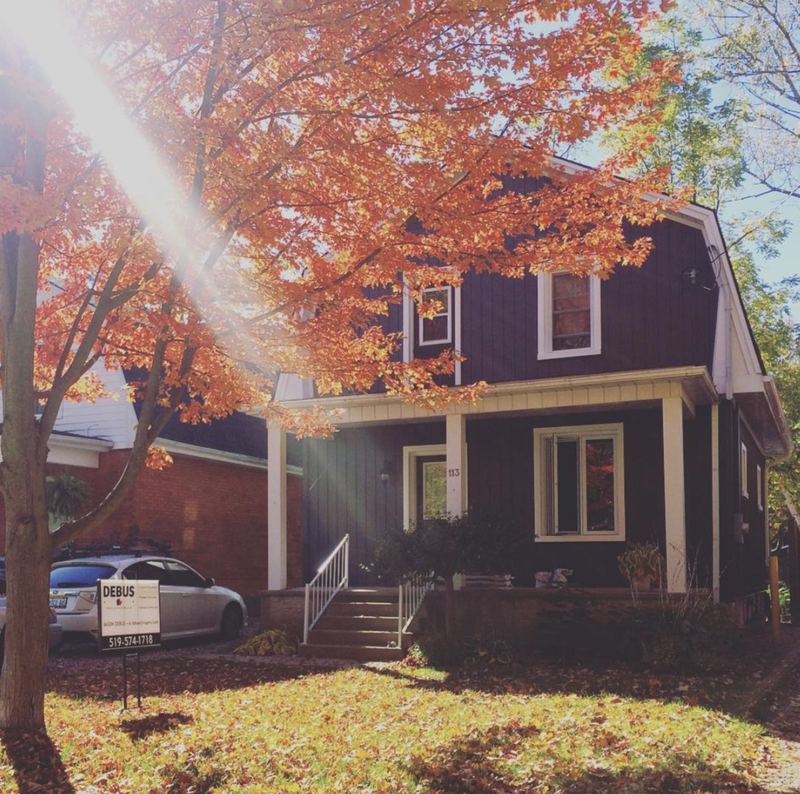 We had a small home that we were renovating in a nice neighbourhood, a reliable low maintenance vehicle, we were living debt free as of 2016 and both had steady work that we enjoyed. We were happy, felt stable and could have lived that way for the next 35 years. Maybe get a dog, get married, have a few kids, go on a two-week vacation once a year... then we could retire and build that studio out back and enjoy sleeping in, tea every day at 4pm, walks every evening, visits with the grandkids, and a couple big trips... if we had the energy. We had this conversation one day and talked about how nice and predictable that was... and then we freaked out about how nice and predictable that was. Do we want kids? Do we want to only travel two weeks a year? Do we want to work the same jobs for the next 35 years? Do we want to wait to do things we enjoy until we are old? Does this sound like the life we imagined for ourselves? It all just wasn't sitting very well. Our gut feeling was that, for us, life might look a bit different. We didn't want to ask ourselves 'what if' at 65 years old. We had always dreamed of travelling across our country and experiencing all that it has to offer. In the summer of 2017, we took out a loan, finished our home renovation, sold half of our belongings and stored the rest. We sold the house to a wonderful young woman, left our jobs, moved to a temporary apartment in the country, and bought a cargo van to turn into our new tiny home on wheels. Our goal is to experience our country while we are young, cross some major items off of our bucket lists, and eventually pick a favourite spot to build a life around the things that bring us joy, freedom, and ultimately a life less ordinary. Nevertheless, it's a purposeful stress - chasing the desire for personal evolution. It is a series of temporary discomforts resulting in permanent growth. Every 'vanlifer' has their unique set-up and their own reasons for their lifestyle choice, and this - in a nutshell - is ours. Whether you have a savings account and a luxury rig, or a shoestring budget and a mattress in the back of a Jeep, we all have the same view of the landscape, we all sleep under the same sky, we all get to be part of a great community, and we're all free to explore what this lifestyle means to each one of us. Yes, we still don't have a bathroom... we manage. Still have a thousand burning questions? We'd love to hear from you! Visit the nifty Contact section of this website where you can leave us a personal message. Happy with simply living vicariously through our story? Neat! Here's our blog that we write in all the time because we love sharing all of this with you.